I love the internet. It perfectly connects rural New England with cultures and places worldwide. How many trips to the library have I saved looking up content online? My recycling bin is also less heavy than it was 15 years ago, when I was reading the Boston Globe every day. And no, the tonnage of ewaste does not replace that in weight (though arguably it may if upstream mining wastes are included). There is a lot of concern, however, that news sources like NYTimes.com and Boston Globe and other media do not have a sustainable business model. They have saved on paper, saved on ink, saved on distribution, but they have not been able to replace subscription income via clickable ads. They are placing the ads in more obnoxious places, but I'm not sure this actually does the sponsor a big favor. It gets my attention, like someone standing in front of my TV during a Celtics game gets my attention. My kids were asking about homeless and panhandling people they encountered in Paris (not in Vermont). I was explaining the economics of asking a million people passing through the train station for a handout only has to be successful a small percentage of the time to achieve income. Kind of like email spam. Unfortunately, the journalists who write articles cannot spam their articles to a big enough group to count on random income. People have to seek their article out, and that limits the number of "eyeballs". What is needed is a tip jar application, similar to the Digg and Tweet buttons I have installed on the top right of this blog. If I could hook up my credit card to a "Tip" Application, and click a quarter or a dollar, I'm sure I'd do it once in awhile. Making a commitment to subscribe to an online news source, such as WSJ, is too big a commitment because I can't make time to get there every day, and there are too many alternative news sources. But if I did go to WSJ now and then, I might leave a tip. It should be hooked to Twitter or Digg or Facebook, the "form an account to give away money" is not a big draw. 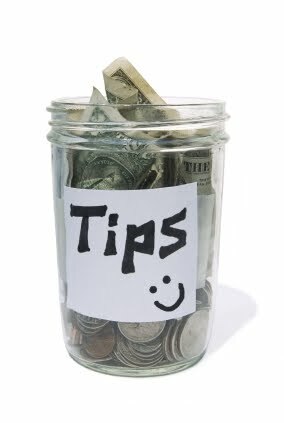 Waiters and waitresses earn pretty significant income from tip jars. I don't know about hotel staff (they certainly aren't getting 20%). What the journalists might need to figure out is for them to get the tip personally before the publication itself figures out how to use the application. But then again, there is no better proof than this blog that editors have a value, maybe the tip jar belongs with the institution not the writer. Having googled around for the tip jar idea, I found Kachingle, and some other betas that came out this year. A one-in-a-million idea in a world with six billion people has six thousand competitors. If Kachingle is acquired by Twitter, Google, Bing or Digg, etc., we may have a game on.